Dalton’s career began in 1978 when she signed with Harbor records as Jill Croston. In 1979, the Academy of Country Music presented her with the award for Top New Female Vocalist of the Year, which prompted her to be signed with Columbia records and launched her into the national scene with her hit, “Crazy Blue Eyes,” written by Dalton and her longtime friend Mary McFadden. The song hit #7 on Country Billboard music charts. Audiences were captivated not only by her music but her natural stage presence and charismatic performances. As a result, she became one of the few women who could open for country megastars such as Hank Williams Jr., Merle Haggard, Willie Nelson, and Charlie Daniels. Her most recognizable hits include “Hard Times,” “Crazy Blue Eyes,” “Hillbilly Girl with the Blues,” “Takin’ it Easy,” and “Everybody Makes Mistakes.” She is also known for her worldwide hit, “Black Coffee” and her signature song, “16th Avenue,” which Billboard Magazine voted one of Country’s Top 100 songs and was adopted as the anthem for Nashville songwriters. Over the years, she has won many awards and received three Grammy nominations. Dalton was the only female that joined in on the collaboration of Willie Nelson’s album, “Half Nelson”, which featured music greats such as, Ray Charles, Neil Diamond, Merle Haggard, Julio Iglesias, George Jones, Leon Russell, Carlos Santana, Mel Tillis, Hank Williams Sr. and Neil Young. Dalton has released three albums on her own label, Song Dog Records. Her last album, “Last Wild Place Anthology” hit #1 on the World Independent Chart as well as the American Western Music Chart. She continues to write songs and plans to record them all. In addition to performing and writing, Dalton founded the non-profit foundation, Let ‘Em Run, in April of 1999. The foundation focuses on protecting and preserving wild horses. The foundation operated out of Northern Nevada. Dalton hosts her own weekly radio show, “Mustang Matters.” The show can be listened to from around the world and focuses on the health and safety of wild mustangs and other creatures in Northern Nevada. 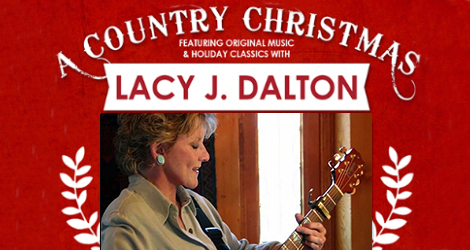 The Foothills Event Center’s doors are going to open at 7:00 pm next Saturday for “A Country Christmas With Lacy J. Dalton!” Show time for this “It’s Happening at The Foothills” concert is 8:00 pm. General Admission tickets are $25 in advance and $30 at the door. Limited VIP tickets are also available for $45 and include a meet and greet with Lacy before the show, reserved seating and a glass of wine. You can purchase tickets at Briar Patch, here at the Foothills, or online!